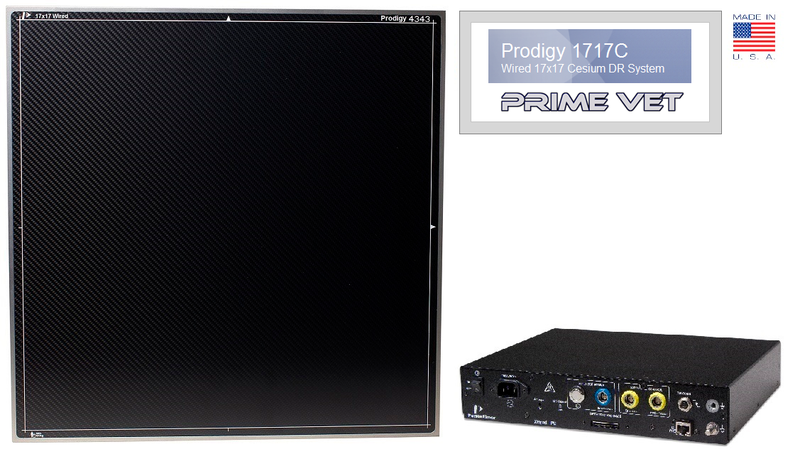 Prodigy Prime VET™ 1717C Wired Cesium DR Systems utilize PerkinElmer’s industry-best XRpad 4343 flat-panel detector technology along with Prime VET™ image capture software to provide superior image quality and easy integration with your existing x-ray room or new equipment installation. Prodigy Prime VET 1717C is a 17×17″ cassette-sized wireless flat panel Cesium detector (FPD) for general digital radiography that easily fits into conventional table and wall-stand trays just like a film or CR cassette, with no modifications or accessories needed. Automatic Exposure Detection (AED) simplifies integration by eliminating the need to create a wired interface with the x-ray generator. Simply insert the detector in the Bucky cassette tray and begin taking patient exams in minutes! What makes it Prodigy detectors better than other panels? Prodigy’s directly deposited Cesium scintillator so extremely sensitive and the pixel matrix so efficiently arranged, that Prodigy detectors allow your technician to reduce dose-to-patient by up-to-45% of your current techniques. Prime VET Image Capture software, is a DICOM 3.0 compliant acquisition software that provides superior image quality and an elegant user-interface, perfectly suited for the hospital and imaging center environment. Prime VET software includes Modality Worklist SCU and Procedure Code Mapping to streamline the workflow in fast-paced offices. Prodigy wired detectors feature a 15 megapixel image matrix with an industry leading 100 micron pixel pitch, 16-bit image output (65,000 shades of grey) that resolves up-to-5 line pairs. Many detectors today offer only a 14-bit output, showing 16,000 grays by comparison. Prodigy Prime VET 1717C provides a true 43×43 cm2 imaging area, which means that it captures x-ray edge-to-edge. System includes a Interface Power Unit (IPU) and a 20′ cable for image transmission.